This is the first volume in Technical Innovation Centers' TRIZ TOOLS Series. 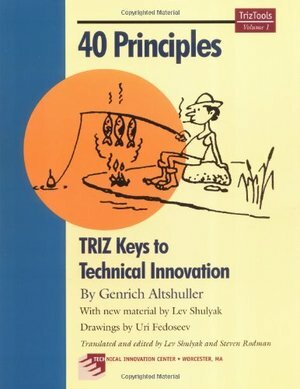 It includes the complete text of Genrich Altshuller's classic 40 Principles, plus: Genrich Altshuller: Father of TRIZ, by Leonid Lerner. Introduction to TRIZ & Three Steps for Solving an Inventive Problem, by Lev Shulyak. TRIZ Contradiction Matrix, one of the most powerful TRIZ Tools for solving inventive problems.